The guidelines for this project were basic: only acoustic instruments allowed. Some contributors stayed traditional, working out pieces to be performed live in real time, while others built their tracks using an array of instruments that would make an ethnomusicologist's head spin. This song was performed on a Breedlove C20, it was recorded into ProTools LE on a Mac G3 via a mix of a Fishman rare earth pickup in the guitar and an AKG C1000s microphone near the sound hole. The signals went into a Mackie 1604 mixer where a bit of reverb was added from an old Alesis Quadraverb. Then the signals went into two channels of the ProTools outboard preamp box. No further processing was done in ProTools. I had originally intended to do something with looping but as the peice progressed it just turned into a song that could be played outright. It took quite a few takes to get a version where there weren't too terribly many mistakes, but it could always be improved. The Queen of the Water is an old traditional fly pattern for trout. This song is sooooo pretty! It puts me in a romantic mood! Solo alto sax. I played a Selmer Series II alto sax with a Meyer 5M mouthpiece and LaVoz Medium hard reed direct to DAT via an SM-57, then transferred it to the computer and post-processed with TC Electronics reverb. Outstanding!! It's nice to hear someone take a risk and play a woodwind instrument solo, and perform experimentally to boot. This song is like a musical soliloquy...as it progresses it has an interesting human element to it, a lot of presence, dynamics, and depth. Choice of reverb is great too. Michael's Christmas present unleashed upon the world. Early random thrashing around his kit was interrupted by moments of lucid beat-keeping and pattern weaving, which I edited into loops and over which I wove some six-string meanderings of my own. The neighbours got the blues even if we didn't, I'll be bound. 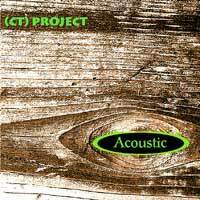 During the production of CT-Acoustic, there was a HUGE debate amongst contributors about whether or not signal processing was true to the spirit of an all-acoustic project. (By the original guidelines, only acoustic instruments could be used, but electronic enhancement was OK.) On this track, I did it both ways; the nylon-string guitar was recorded completely dry, while the two tracks of flutes (shakuhachi and Boehm) were recorded with lots of reverb. Third movement of an early piece written for the Cinders trio. I really like the Eastern/Middle-Eastern harmony in this song. It's a very thoughtful tune with some interesting juxtaposition of sounds and phrases. Great guitar work. Delightfully dark and obscure....piano strings, right? (can't tell if its a grand or upright, however). This really brings out the weird 50's sci-fi movie in me.....I have about 70 of them, and this would make an excellent soundtrack replacement for some. Well done! Send me more like this if you have it.